I was about to click away from this relatively boring article about the US debt being over $7 trillion dollars when I notice the ad on the page. The ad is for some sort of credit card/debt reduction thing. It’s too bad there wasn’t an option in the selection box that said “sluggish economy, security and defense.” I guess it’s irony or comedy or whatever you want to call it. Regardless, it amused me. 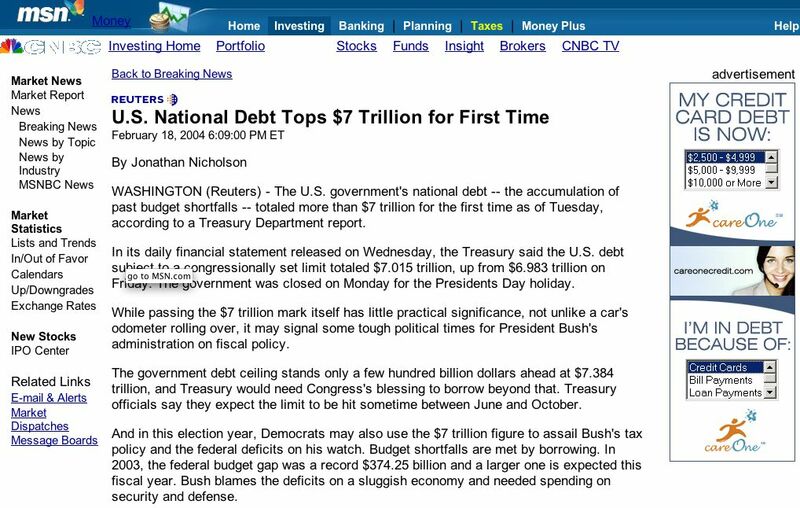 Oh, the US debt is also at $7 trillion, that’s a lot of money. Now, it’s all imaginary money, but it’s still a lot.